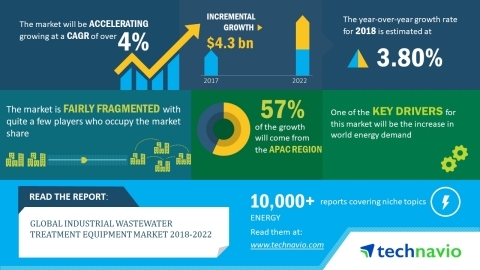 Technavio analysts forecast the global industrial wastewater treatment equipment market to grow at a CAGR of over 4% during the forecast period, according to their latest market research report. Advances in industrial wastewater treatment technology is one of the major trends being witnessed in the global industrial wastewater treatment equipment market 2018-2022. Membrane technologies play a significant role in wastewater treatment and energy sustainability. Industrial wastewater treatment involves different technologies like wastewater treatment by MBR, desalination by RO, and membrane-based fuel cells. Membrane technologies meet sustainability criteria pertaining to adaptability, ease of use, environmental impact, land usage, and flexibility. In emerging economies such as China and India, the demand for energy is increasing owing to the fast-paced development. The application of technologies like horizontal drilling and hydraulic fracturing has propelled the development of the US shale oil and gas reserves. This, in turn, is expected to increase the natural gas resources two-folds when compared with the past decade. The global industrial wastewater treatment equipment market research report provides market segmentation by end-user (manufacturing and energy), and by region (the Americas, EMEA, and APAC). It provides an in-depth analysis of the prominent factors influencing the market, including drivers, opportunities, trends, and industry-specific challenges. The manufacturing segment held the largest market share in 2017, accounting for nearly 50% of the market. This end-user segment is expected to dominate the global market throughout the forecast period. APAC led the market in 2017 with a market share of nearly 39%. This region is expected to dominate the market through 2022, with an increase in its market share by nearly 3%.